The Martin Smith w-700 guitar has been beautifully crafted to offer the player a deep rich tone from it's large 41" hollow dreadnought body. Its distinctive cutaway gives the guitar its popular stylish look as well as allowing the player to reach higher notes with ease. The Martin Smith w-700 neck has been designed with a low action for a smooth and easy playing experience with precise intonation. Finished in a stunning Matt effect, the w-700 series stands out with it's quality binding, pearloid inlays and Embossed headstock featuring fully geared chrome machine heads making the Martin Smith premium guitar a truly beautiful instrument to hold and play for all guitarists from beginners to enthusiasts. 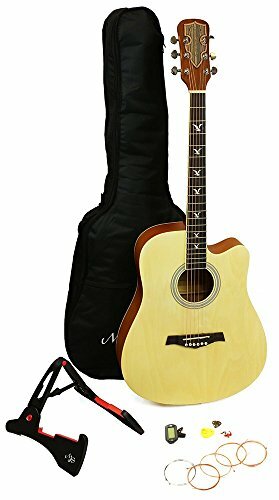 Included with the guitar is a padded dreadnought guitar case, ensuring the guitar is protected in storage and transport as well as spare strings, an adjustable guitar strap, guitar stand and Plectrums. If you have any questions about this product by Martin Smith, contact us by completing and submitting the form below. If you are looking for a specif part number, please include it with your message.